Have you ever looked at someone’s face and just thought, ‘I want you all over my feet?’. That’s a pretty normal thought, so I assume you said yes. In which case, you’re in luck my friend. 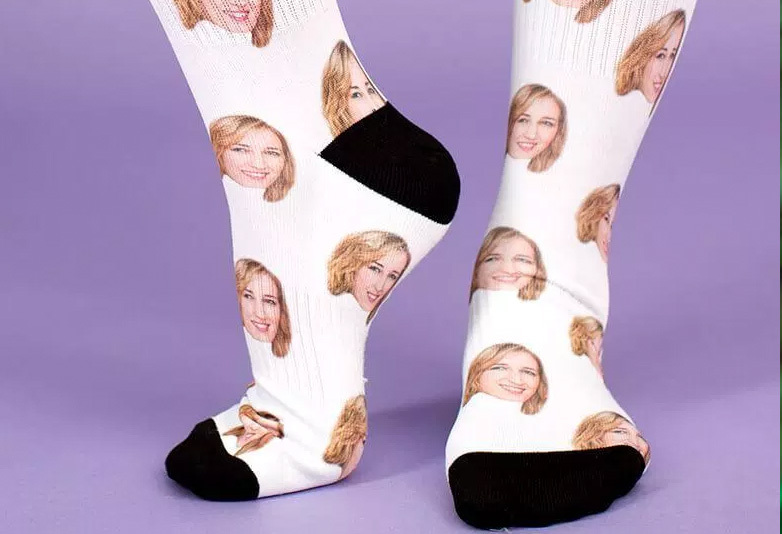 There’s a company out there who specialise in creating personalised socks with the face of anyone you want printed on them. Prezzybox is the company behind the absolutely bizarre idea, and for the price of just £19.99, you can have your own pair of customisable cotton socks. It could be your best friend, your pet, or you could gift someone their worst enemy – or the random bouncer you got a selfie with outside a club once. Walk a mile in their shoes, literally. 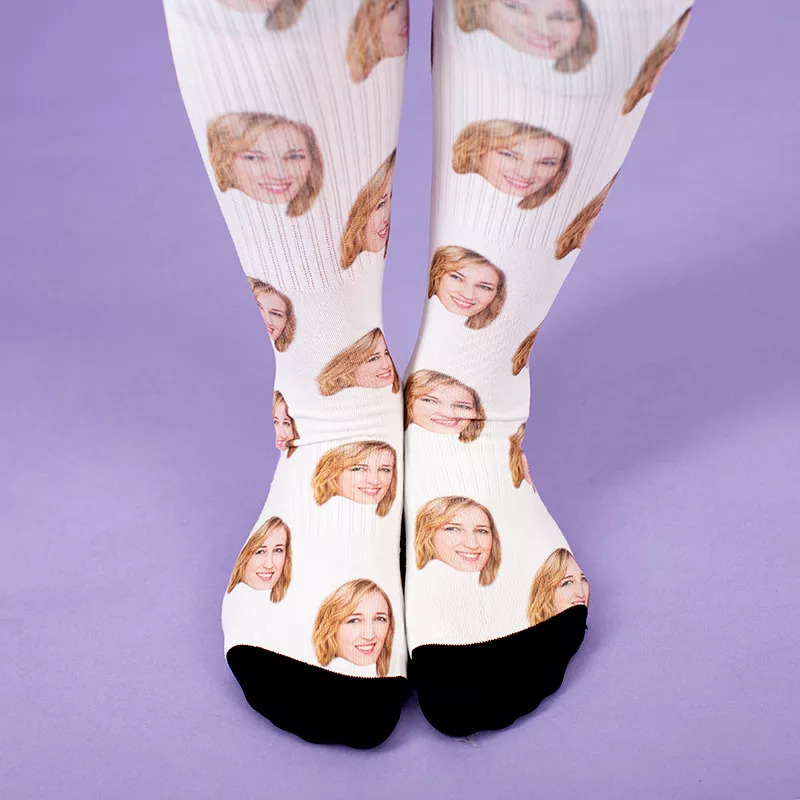 These awesome socks, with your face on, allow your partner, best friend, or manager if you’re feeling brave, to carry you with them wherever they go. Just make sure they clean you regularly. Made from soft poly cotton, available in three sizes and a choice of colours. Just upload a clear picture of your face of choice (your face, their face, Channing Tatum’s face, etc.) and we’ll deliver some sock and roll to their footwear. Of course, you don’t have to put your mate’s face on there, you could have your dog printed on them and teach him to ‘heel’, or even your ‘sole mate’ if you’re so inclined. Just imagine the petty glee you’ll feel as you subject a picture of your ‘mate’ who chews with his mouth open, or the boss who overlooked you for promotion, to your stinky feet. It’ll be glorious, and best of all, they’ll never know you’ve taken sweaty revenge on them. I can’t think of a better option for the office ‘Secret Santa’. According to research conducted last year, personalised socks can’t be any worse than some of the gifts people get for Secret Santa, as one-third of Brits go for a ‘funny gift’ for their colleagues at Christmas time. While most people don’t seem to mind the sillier gifts, the study – which sampled 1,500 working adults and was conducted by V.I.Poo – found 53 per cent of people said it was important to buy something thoughtful. Furthermore, they found one in five Brits surveyed said they always opt for a present which refers to a private joke between themselves and the recipient of the present. It’s nice to know some people put some real thought into their gifts, as opposed to wandering into Boots and finding the first thing under the price limit. I can’t think of a better and more personal stocking filler, and if you don’t fancy socks, Fire Box sell personalised car air fresheners with any face of your choosing, and Etsy are offering personalised temporary tattoos. I’m sure we all have that one self-centred friend who would welcome any item adorned with their own face.